Peter Jackson: Kudos. Ups. Props. You rock. The director and producer of The Hobbit has started his behind the scenes vlog. He posted the first video last night, and it's not just a few minutes of pretty imagery. It's ten minutes and takes fans all over the set! We get to see Rivendell, Bag End, weapon production, costumes, and a certain wizard. To see Jackson back in this world is... heartening. To see the locations again and know that in this world, Middle Earth is living and breathing again is moving. It takes me to a sappy place. 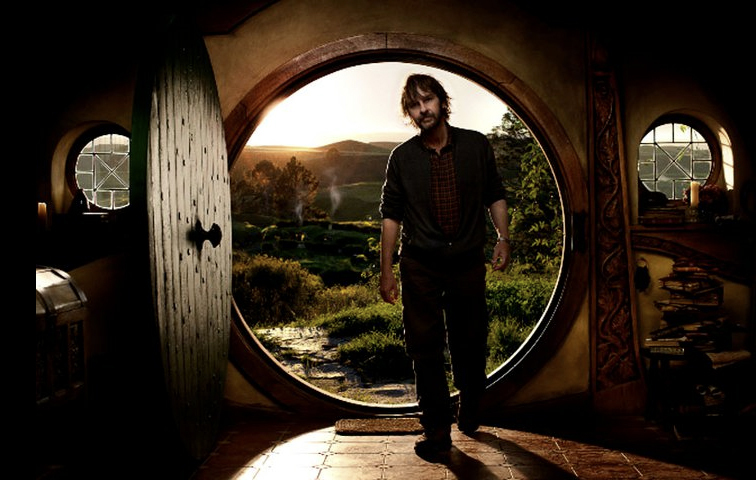 So, thank you, Peter Jackson for your devotion to the fans. We know that even a short video can take a lot of time to put together. I'm so thrilled that this movie is finally happening. I watched it like 3 times this morning! I got chills and I am so excited! It's being shot at 48 frames per second. In 3D. I hadn't kept track of this project and am disappointed to learn that Guillermo del Toro isn't involved any longer. I'm not one of those who loved Peter Jackson's Lord of the Rings and was looking forward to the distinctive look and feel that del Toro's movies often have. Now that he's no longer involved...well, I'll probably still see it but I'm no longer excited about it. I watched the video a few times. I'm so happy to see Rivendell and the actors being called by their character names. I'm so looking forward to more vlogs from Mr. Jackson! Her Universe: New Shirt Designs!